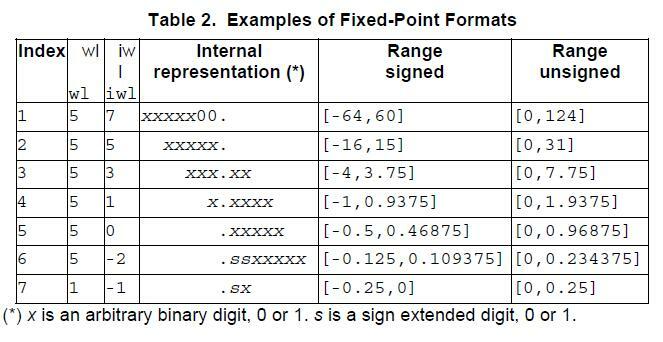 Page-20 of "SystemC 2.0.1 Language Reference Manual Revision 1.0", "Index 6" of "Table 2. Examples of Fixed-Point Formats"
But I think the range should be [-0.125, 0.1171875], because the minimum data is ".1110000" and the maximum one is ".0001111". But I think the range shoulde be [0, 0.2421875], because the minimum data is ".0000000" and the maximum one is ".0011111". Whether my understanding is correct? Can anybody give me help? The 2.0.1 LRM is very old. SystemC became an IEEE standard in the meantime, and luckily the same example is now part of the IEEE Std. 1666-2011 (see 7.10.1, Table 32). The ranges mentioned there match the ones you were expecting.